Be it a pearl's natural organic origin, emanating from a mollusk or Coco Chanel's pearl donned image imprinted in our heads, pearls have always created a certain prissy intrigue that remains unmatched. Fresh water, cultured or even pearl knock offs make for an interesting twist to almost any category of ensemble. Rock and Rolla Gwen Steffani wears it with as much élan as Chanel when they manage to incorporate these beautiful stones in almost all their collections. I cannot possibly forget Audrey Hepburn in Breakfast at Tiffany's with her pearl choker and have fancied my mother's pearls for as long as I can remember. This versatile piece of necklace that is possibly one of my oldest possessions has been reused so many times that I was almost beginning to tire of its predictability. A jumpsuit with an open back and boudoir noir peek-a-boo lace gave me the perfect opportunity to get this piece out and play with it a little. 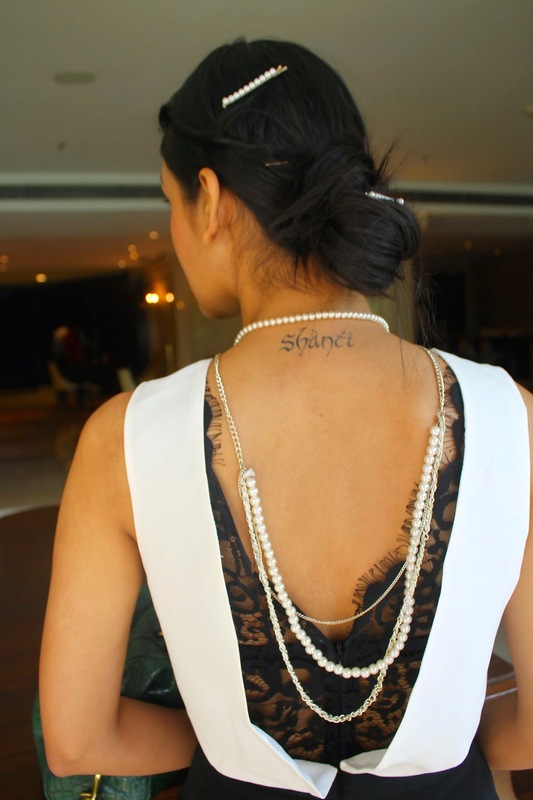 'Back jewellery' is best worked with open backs, giving you an opportunity to flaunt some skin while not making it trashy. Of course, an inspiration by DSquared had me at a cursory glance. Of course, it would not be possible to create this amalgamation of monochrome and funk without the pops of colour in the form of the shoes and bag. As a self proclaimed style guru, let me leave you with a little piece of advice. It becomes magically easy to work monochrome in summers without looking dull with pops of colour on your shoes or bag or both. Ok, I am a Douglas Adams kind of geek. Loved the look..and how u styled that pearl piece..
Hi Shreya, This is stunning look!